While you're waiting for all the Black Friday game deals to begin, you can already start plotting out your plan of attack at Walmart. The titan of both online and brick-and-mortar retail has revealed all of the discounts it's planning, and I've picked out the biggest and best in the gaming and tech space to make your search easier. You can take a look at the goods now, but note that these prices are not live yet; the discounts will begin on Wednesday, Nov. 21 at 10pm EST / 7pm PST for online shoppers and on Thursday, Nov. 22 at 6pm local time at Walmart stores. Spider-Man PS4 Slim 1TB bundle for $199 (save $100): Get one of the best PS4 exclusives of the year and a brand new system to play it on all for $100 less than you'd normally pay for the system alone. This is a fantastic deal for yourself or the budding Marvel fan in your life. Xbox One X 1TB for $399 (save $100): At just over a year old, decent discounts on Xbox One X are still hard to find - and this one is more than decent. Snag the most powerful console ever made for less and you'll have many happy returns. 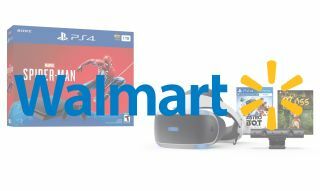 PlayStation VR Astro Bot and Moss Bundle for $199 (save $100): PlayStation VR finally has a neat set of killer games, and this bundle has two that you can't miss plus everything you need to play for $100 less. Just plug everything into your PS4!